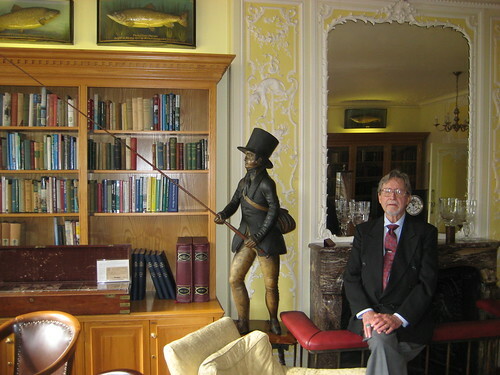 Gordon M. Wickstrom at the London Fly Fisher’s Club. Editor’s note: Back in 2011, we featured entries from Gordon M. Wickstrom’s The History of Fishing for Trout with Artificial Flies in Britain and America: A Chronology of Five Hundred Years, 1496 to 2000. In this chronology, Gordon marks significant events—the publication of seminal books, tackle developments, important social changes, the dissemination of trout species beyond their native ranges, etc.—on both sides of the Atlantic. Since many readers were not around in those heady early days of the blog, I thought it deserves a repost. Lest the reader of this chronology wonder that the history of fly fishing appears confined to the British Isles and North America, it should be remembered that artificial flies must have been in use in Europe from Antiquity; though documentation is fragmentary. In the modern era, in Germany, for instance, vederangle or “feathered hooks” and their dressings are well documented in the sixteenth century. It is possible, too, though only a conjecture, that flies for trout and grayling came to England with the Normans between the twelfth and fifteenth centuries. Still, the influence of other countries on the development of fly fishing has been peripheral to that of Britain and America. Fly fishing may be said to have had its development within the English language where it became the matter of a rich, ample, and sustained literature. In fact, fly fishing can be imagined as the material expression of that literature. An illustration from Wynkyn de Worde’s Boke of Saint Albans. Certaine Experiments Concerning Fish and Fruite, by John Taverner who observed and was the first to write about the phases of mayfly development from nymph to dun and to note how trout feed on the nymph. The Compleat Angler or The Contemplative Man’s Recreation, by Izaak Walton. No sport had before been the matter of a literary masterpiece. “Father” Walton fished bait, not the artificial fly. But he established a benchmark and ideal of angling as a lyric, pastoral, and philosophical idyll that has inspired and largely determined angler consciousness to this day. Charles Cotton, Cavalier poet, aristocrat, and companion to commoner Izaak Walton, became the founder of modern fly fishing and fly making with the twelve chapters entitled “Instructions How to Angle for Trout and Grayling in a Clear Stream” that he contributed to Walton’s fifth edition of The Compleat Angler. 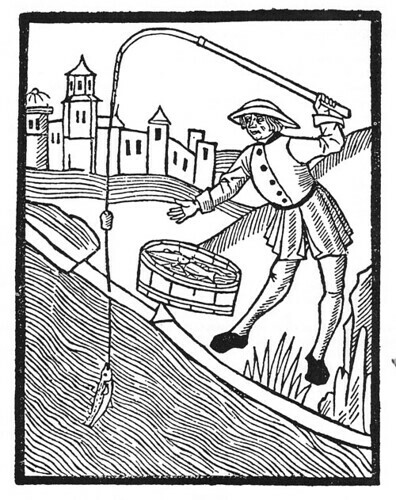 He advised anglers for the first time to fish “fine and far off.” This admonition was crucial to all that was to come. During this period, Spanish silkworm gut replaces horse hair as leader material. Silk replaces horse hair for lines. Innovative mixtures of hair and silk were sometimes used. The “winch” or reel comes into use and will make possible the use of modern fly lines. Guides appeared on rods, replacing dead-off attachment of line to the top of the rod–thus making possible longer lines and their control. Izaak Walton’s The Compleat Angler. 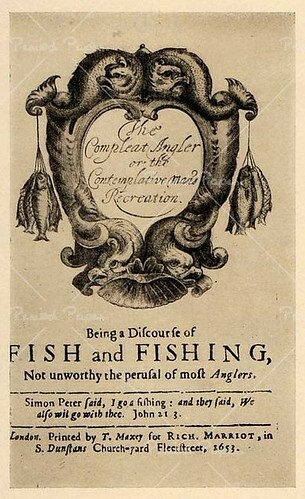 The Art of Angling, by Richard Bowlker, marked the beginning of modern fly dressing and dominated angling technique and fly tying in the second half of the eighteenth century. American sport fishing was gaining popularity, dependent as it was on its origins in British method and theory and on supply of tackle. The Fly Fisher’s Entomology, by Alfred Ronalds, was the first and still impressive, beautifully illustrated, study describing and classifying the insects that trout and grayling feed upon in British waters. Vade Mecum of Fly-Fishing for Trout, by George Pulman. Pulman has been generally credited as the first to define the complete method of fishing a dry, floating fly. Samuel Phillippe built the first split-bamboo section for a fishing rod in Easton, Pennsylvania. This process would make possible, in the hands of Hiram Leonard in the 1880s, the light, fast, stiff modern rod of sufficient backbone to cast modern silk lines into the wind to considerable distances. Gordon Wickstrom is the author of Notes from an Old Fly Book (2001) and Late in an Angler’s Life (2004), editor of The Boulder Creek Angler newsletter, and writer and director of The Great Debate—A Fantasia for Anglers, an imagined debate between Frederic M. Halford and G. E. M. Skues.